My biggest fear in life is Alzheimer’s disease. It runs in my family. It took my Grandma away from us. My Dad is involved in an ongoing study and he worries about it (and I think he shows he has a gene that makes him getting it more likely). I obsess about it. Every time I forget someone’s name, or when I can’t remember what the halls of my high school looked like, I start to think I’m suffering from early onset Alzheimer’s. Hey. It’s my obsession. Give me this one thing (because I rarely obsess over anything …yes, that sentence was meant to be read sarcastically). My early takeaways . . .
Why do I like this book? Isn’t it stuff I already know? Well, yes and no. I tend to eat in ways that are geared towards athletes or people who need to lose a massive amount of weight and the diets tend to be gimmicky and unsustainable. And I’m not obese or overweight, so eating like someone trying to lose 3o, 40, or 50 pounds is a little silly. I’m not saying to obese people they shouldn’t try silly or gimmicky diets – do everything you need to do to lose weight. My quick thought on being overweight – once I read about being 20, 30, or 40 pounds overweight and the author said, “imagine when you woke up in the morning I handed you a 25 pound bag of sand and told you to carry it around all day.” The point was, you’d hate it. By the end of the day, your back would hurt, your knees would hurt. You would feel tired. You would want to sit down and rest. You might find yourself out of breath when walking up a flight of stairs or playing in the yard with your kids. You see where the lesson is, right? If a person is 20+ pounds overweight, this is how they’re living every day. Most weight gain is gradual and we don’t feel much different because the weight gain came a pound or two at a time, over many months and years, but if you’ve looked at the height-weight chart, lately, you and I both know how many bags of sand you’re carrying and what that’s doing to you. OK. So “weight” is another thing I obsess about. Two things, OK. That’s not a problem. I could quit obsessing at any time. I’m not here to scold anyone about their weight, but I wish anyone overweight would help themselves lose a little – obesity is as bad for you as smoking or drug use. Just my strong opinion. 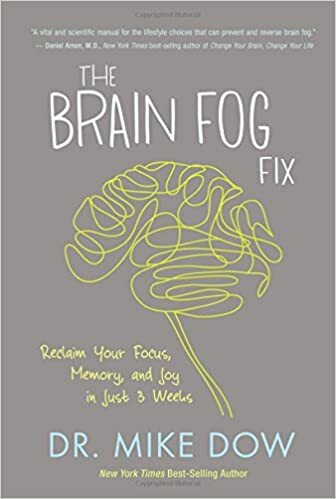 Back to the “brain fog.” I’ll admit. I’ve been in a bit of a “fog” and it’s partly because of some crazy diet and eating pattern I’ve been doing. And the point of this blog isn’t about “whoa is me”, but the main point it this – if you feel like you’re struggling a little with brain fog, depression, anxiety, and sleep problems, well, I’m not a doctor, but it could be partially (and I do want to make sure you notice I used the word “partially” because I know it’s not a quick fix and one-size-fits-all solution), but it’s a part. Eating right and exercising isn’t a revolutionary concept, but this book puts it all together and maybe, just maybe, if I was (or am) going to get Alzheimer’s, maybe I can take some steps to delay it (or avoid it all together).